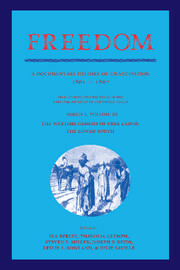 Freedom: A Documentary History of Emancipation, 1861–1867 is a multi-volume history of the transition from slavery to freedom in the U.S. South. Using documents selected from the vast holdings of the National Archives, Freedom depicts emancipation in the words of the participants-slaves and ex-slaves, slaveholders and former slaveholders, agents of the Freedmen's Bureau, army officers, and other contemporaries. Interpretive essays by the editors introduce the documents and set them in context. Freedom conveys with first-person immediacy the experiences of the liberated: the quiet personal satisfaction of meeting an old master on equal terms and the outrage of ejection from a segregated streetcar; the elation of a fugitive slave enlisting in the Union army and the humiliation of a laborer cheated out of hard-earned wages; the joy of a family reunion after years of forced separation and the distress of having a child involuntarily apprenticed to a former owner; the hope that freedom would bring a new world and the fear that, in too many ways, life would be much as before.